How do you define Sales Productivity? If you ask 10 people, you will probably get 10 different answers. In the simplest terms, Sales Productivity is improving sales efficiency in order to utilize the least number of hours to achieve the best possible results. How you measure those sales results varies from organization to organization. To improve sales productivity, salespersons and sales managers focus on optimizing sales operations to reach the best possible outcome. Salespersons can improve their sales productivity by implementing better sales processes; generating meaningful, timely conversations with prospects and clients; and using better tools to improve their sales efficiency. In 2010, we at LightArrow set out to develop the most comprehensive personal organization app available in the market today. As this app, LifeTopix, evolved over the last few years, we’ve participated in thousands of conversations with our customers about how they’re using the app. We’re finding that more and more salespersons and micro/small business owners are using LifeTopix to manage not only their personal lives, but also their business operations and clients. To meet this demand, we added features requested by our user community with the goal of enhancing sales operations. 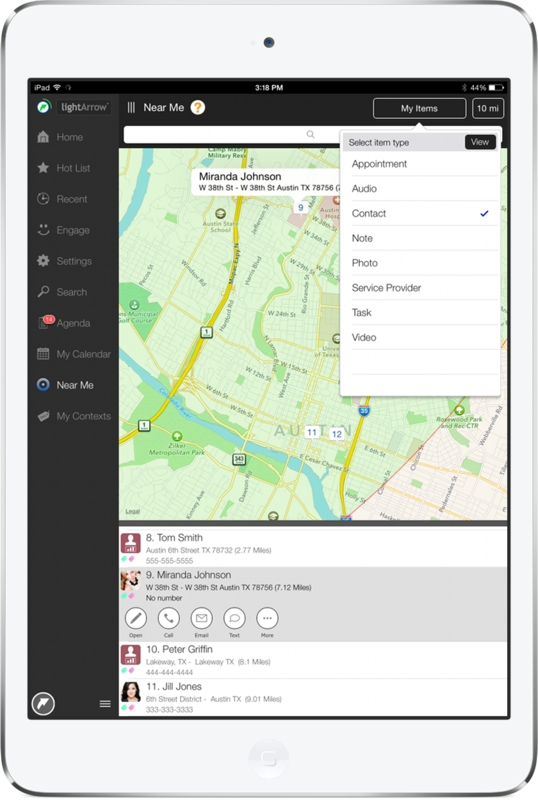 Some of these features are enabled through the in-app purchases available in LifeTopix, Pro Contacts and Pro Inbox. Furthermore, in the coming weeks, we’ll release the stand-alone apps, Pro.Inbox and Pro.Contacts, for those who want to primarily concentrate on managing information streams from social, web, and email or contacts. Keep reading to learn more about these exciting new, features and how you can take advantage of them today. 1. Does Your CRM Meet the Demands of the Post PC Era? 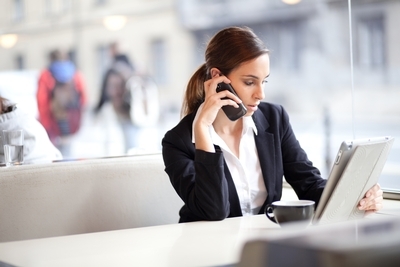 As personal computers decline and mobile devices increase, otherwise known as the Post-PC Era, more and more salespersons will use their mobile devices while on the go, in lieu of laptops. In fact, salespersons are one of the fastest-growing segments of those who are adopting tablets as their device of choice when on the move. As mobile software evolves, it’s becoming more and more sophisticated to meet the demands of those who wish to do business while mobile, without a laptop. We’ve been designing LifeTopix for the post-pc era from the get-go. LifeTopix is not an app that does one thing, such as making a to-do list or remembering to pick up milk. Its features run the gamut. It provides everything from a sophisticated calendar – to project management – to social media management – and more. It fully runs on your device, which is particularly important for the salesperson that doesn’t have Wi-Fi available at all times while on the road. 2. How Can You Manage Your Leads, Prospects & Customers More Efficiently? In the latest version of LifeTopix, you’ll find new Contact Management features, which allow you to more efficiently manage your leads, prospects and clients. Most importantly, we’ve added custom log forms and custom log items, which allow you to add user-defined information about your contacts and subsequently group by these contacts by log items. For example, Mary works for a small wine producer in California and her job is to find wine distributors and retailers to sell the wine from her winery. She manages her leads, prospects, and clients in LifeTopix. To help her better manage her contacts, Mary created a custom log form, which she titled: Sales information. She’s added several log items, which include, “Lead Score” as well as other relevant information. This way, Mary can group all of the sales leads by Lead Score, which allows her to better prioritize her sales calls. In the following image, you’re viewing LifeTopix’s Grid view for Contacts, which is available in the People + Services topic with the Pro Contacts in-app purchase. It’s a spreadsheet-like format, which allows you to easily manage many contacts from one view. You can see how Mary has created the “Lead Score” log item and sorted her contacts by Lead Score. What’s great about this view in LifeTopix is that Mary can easily locate all the information for her prospects and customers in one place. She can also set reminders and appointments, schedule associated tasks, add notes, call or email the client directly, record expenses, and view any other custom information — all from this useful view in LifeTopix. 3. What’s a Better Way to Generate Meaningful, Timely Conversations? One of the best ways to increase your sales productivity is to generate timely, meaningful conversations. A good strategy for making a conversation meaningful and positive is to know something about your customer and his or her company and industry. You should always have a holistic view of your leads, prospects, and clients. As you build and nurture your relationships with prospects and customers, it’s important to stay up to date. Social engagement can give you insight into your prospects and customers, allowing you to tailor your interactions appropriately. To help you to stay on top of customers, industries, and topics that your customers are interested in, we’ve added the Pro Inbox features of LifeTopix. LifeTopix allows you to create information streams from email, Twitter, Facebook and the web with rules. For example, Mary the wine producer’s salesperson, can collect information from social, web, and email about her clients and the wine industry and read this information from one view. This saves countless hours of switching from various social media and email applications to gather the information she needs about her clients and the wine industry. For example, if Mary uses Twitter, she can filter data from those she follows, Twitter users, public lists, or all of Twitter. 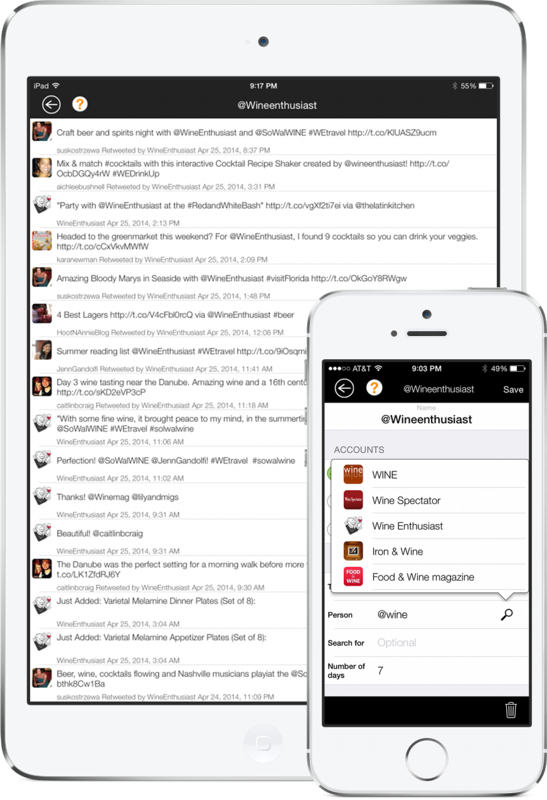 She can add keywords or hashtags to find specific information about wine distributors and retailers. She can collect, share and convert her data nuggets to actionable items such as tasks, projects, products, appointments, hosting events, attending events, notes, trips, visitors and inbox items. 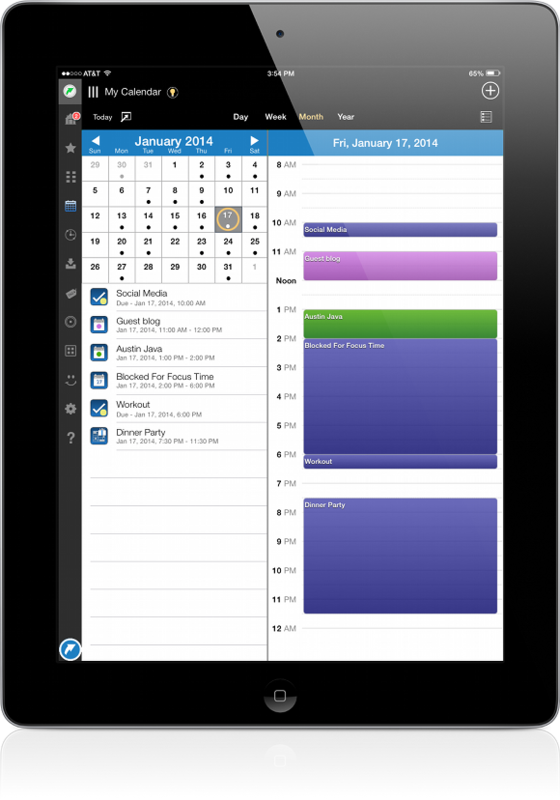 She can also stay on task with comprehensive calendar views, which show converted tasks, appointments and more. The following image shows an example of how Mary would configure a Twitter stream from public twitter accounts to gather information about the wine industry. 4. How Do You Strike When the Iron is Hot? Not only can Mary collect important information, she can also strike when the iron is hot because with LifeTopix, she can easily make email, web data and social streams actionable. For example, if Mary notices that a client is requesting information via Twitter or if there is an important change in the wine industry that affects her prospects or clients, she can easily turn this information into action by converting it to an event, appointment, task, reminder or other LifeTopix object in a few simple clicks – from one app, as shown in the following graphic. 5. How Do You Save Time Traveling from Call to Call? 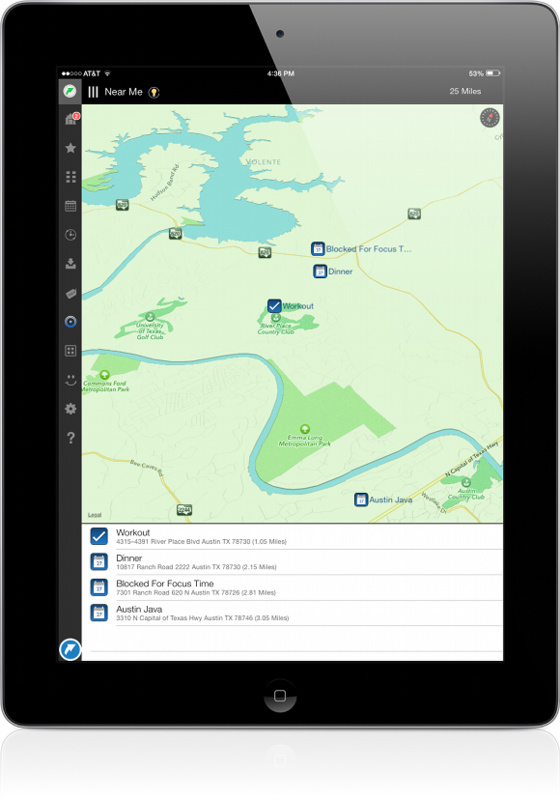 Planning your activity with Location Services can help you increase your sales productivity when traveling. All your precious time spent commuting from place-to-place or spending time in the air takes away from your selling time. For example, Mary is planning a trip to Austin, TX to meet with an important client who distributes wine for the Texas region. While she’s there, she plans to meet with other potential distributors. With LifeTopix, it’s easy to see the distributors that are listed as contacts and are located in the vicinity of the client she’s visiting, which enables her to efficiently set up sales visits with those prospects, as shown in the following image. We’ve only described a portion of the LifeTopix features that can help you improve your sales productivity. As you begin to use the LifeTopix app, you’ll find ways to become more efficient and productive in many aspects of your work and life. Please comment and tell us about your experience with LifeTopix or any feature requests that you may have. Cheers! Team LightArrow is excited about the new updates of LifeTopix 8 and My.Agenda 3. 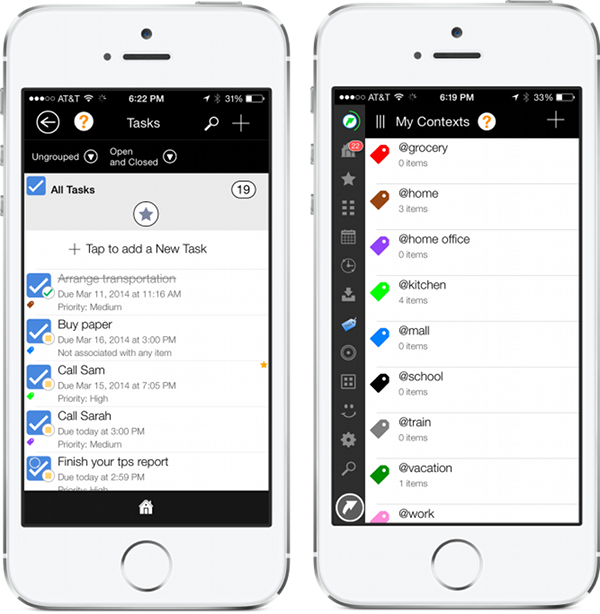 Our new updates include several new features to maximize your productivity at home, at work, and while you’re on the go. Keep reading to learn how you can take advantage of the latest features. 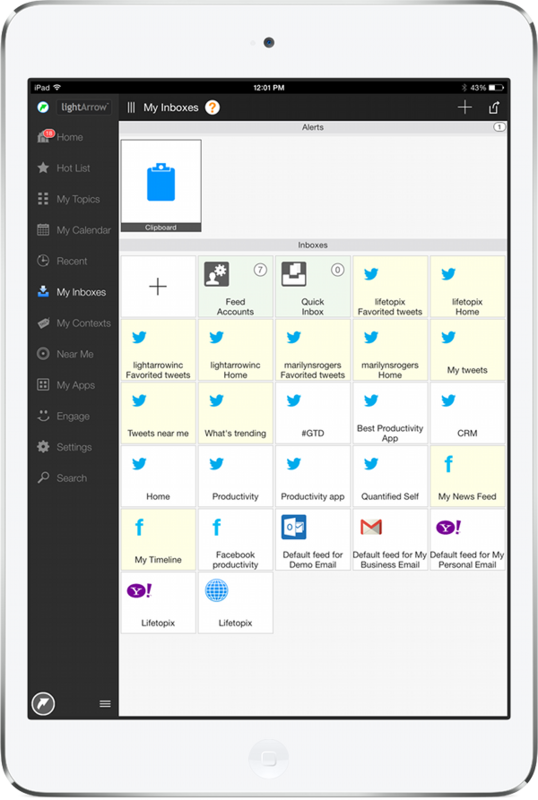 All Lightarrow apps have been redesigned with a new look and a new app icon. LifeTopix has already been updated, and the other apps in the LightArrow family will be released over the next few weeks with the new look. The most significant change is the new flat look of the 12 topics view, as represented by the following image. Another significant improvement is the new expanding cell. With this change, when you tap on a cell, you’re instantly given options for common functions for the item you’re managing. For example, as shown in the following image, you’re now able to easily access common features for a task, as shown in the “Maintenance” task. You’ll also notice new colors and icons throughout the app, and topic items now inherit topic colors. In addition, lists have been replaced with tiles to make it easier to find and edit information. 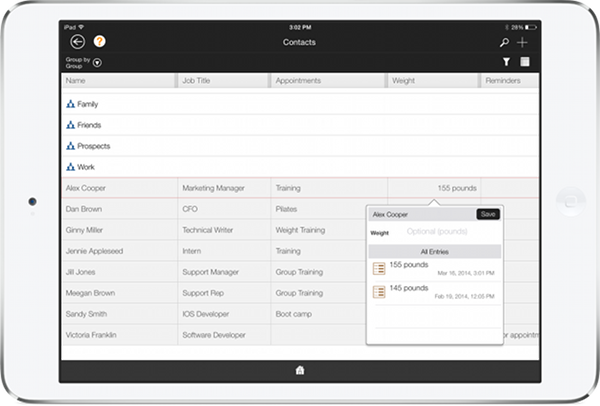 The Pro.Contacts Pack takes customer relationship management to a new level. 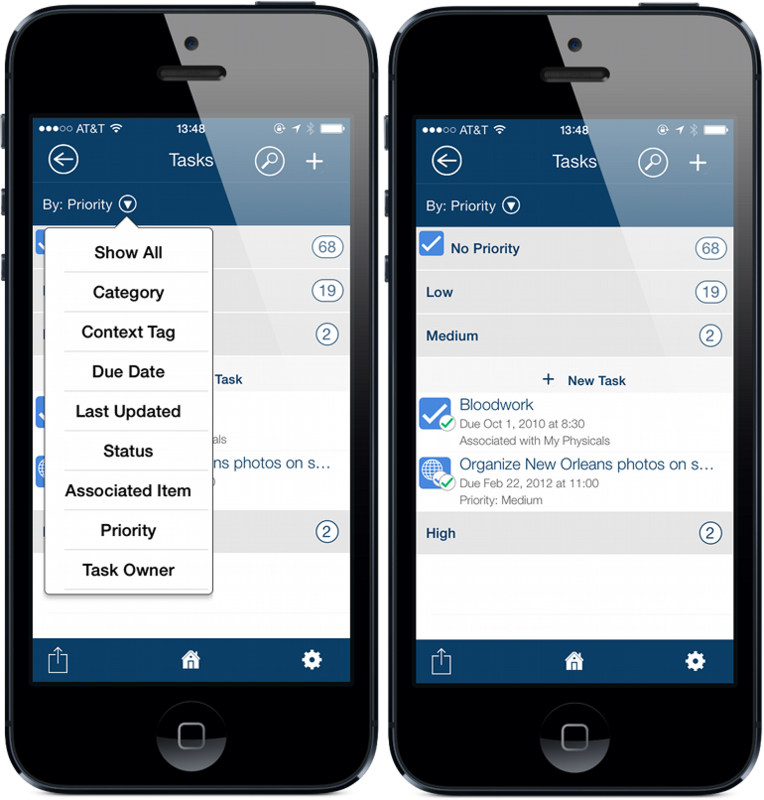 This pack adds new functionality to the People + Services topic in LifeTopix and My.Agenda, which allows you to better manage your personal and customer relationships. In addition, we’ll soon be introducing this functionality as a stand-alone app, for those who only wish to manage their contacts. The following image represents a contact showing custom form fields for Alex Cooper. In this example, the user has added custom fields for her personal training clients. This gives her the ability to record their weight and BMI and to track these statistics over time to measure how her clients are progressing. 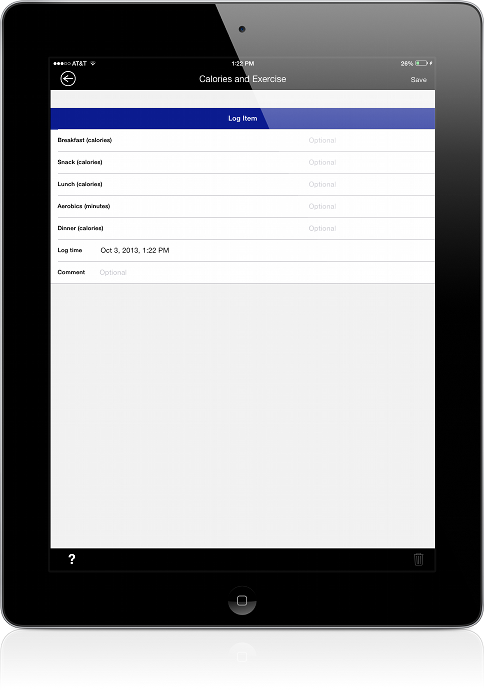 The next image shows an example of the custom log form and a list of entries for the Personal Training log form. Keep in mind; these forms are completely user configurable, allowing you to track any stats for friends, customers, prospects, family or other contacts. You can view the stats individually for the contact, by type of stat, or by all contacts. 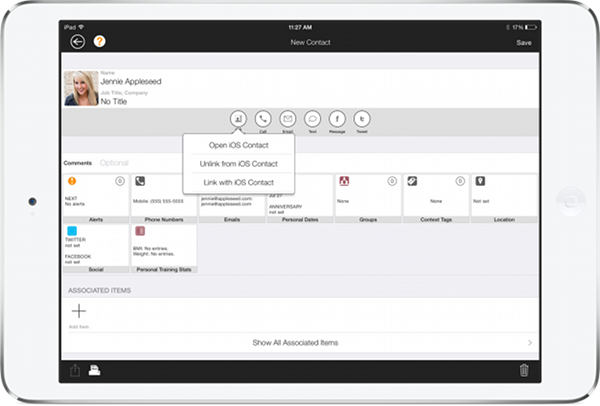 With the addition of the Pro.Contacts Pack, you can manage multiple attributes for contacts at once with the grid view. You can decide which fields to show and in your specified order via the filter. In addition, you can contact your friends, family, and colleagues directly from this view via phone (iPhone only), email, or text. An example is shown below for a personal trainer who is managing her clients. With the addition of the Pro.Contacts Pack, you can import contacts through a comma separated values (CSV) file. You can email this .csv file to an email address that is accessible from your device and open it directly in your LightArrow app. Specific directions are available in your online help. If you wish to manage additional contacts above the default of 100, you can purchase more contacts via the Extra Contacts packs. 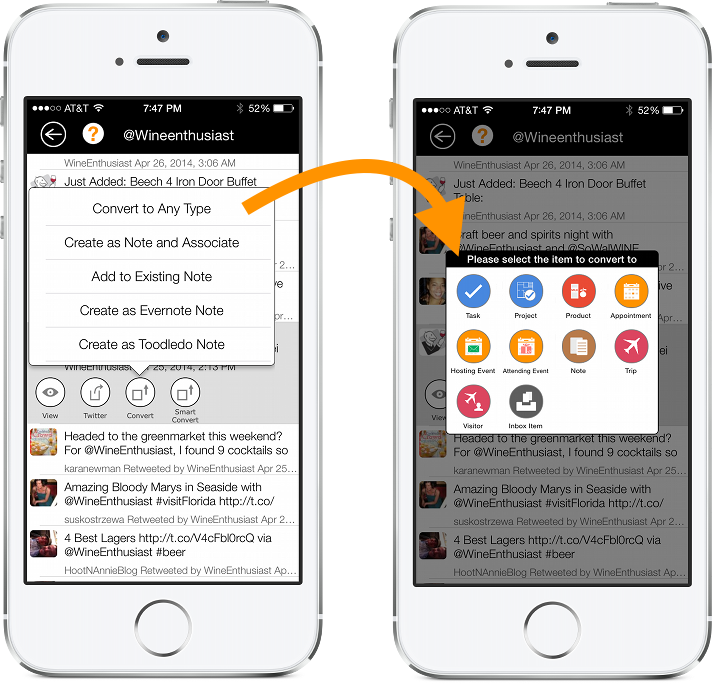 The integration with your iOS Contacts has been improved in this version of your LightArrow app. You can now easily import contacts from your iOS contacts or easily link a contact in your app to an iOS contact. Information imported from the iOS contact includes first and last name, Facebook profile info and Twitter handle, birthday, anniversary, email, company, phone numbers, email, company, notes, and address. The following example represents a contact and shows the options for linking/importing from iOS contacts. In the 8.0 version of the LightArrow app engine, we’ve revamped “My Inboxes” to act as a place to harvest information from multiple sources, including Twitter, Facebook, Email, and the Web. This is excellent for researchers and anyone else who wishes to gather information from multiple sources all in one place. Whether you’re a business person, parent, or student, you’re inundated with information from many sources — including email, social media, and the web. Most likely, you’re hopping between Twitter, Email, Facebook, and the web to keep up with all of this information. In the new version of your LightArrow app, as you discover and harvest this information from these multiple sources, you can make this information actionable. For example, your supervisor might request that you create a report via email or you might find a webinar mentioned on Twitter that you want to attend. You can convert these actionable items from web, email, or social channels into items you can take action on such as: tasks, notes, events, projects, trips, visitors, or products. For example, you can convert the webinar invitation found on Twitter into an event in just a few simple taps – no app switching is required. While you’re in the process of converting your email or social media messages to actionable items, you have the choice to convert the links in those messages to bookmarks. Bookmarks can be managed in the Bookmarks + Lockers topic and associated with many items in your LightArrow app. An example is shown below. If you wish to manage more than the default 10 rules, you can purchase Extra Inbox rules, up to 100. The Health + Goals topic (previously Health + Activity) now has the addition of goal management. Goals are items you wish to reach, such as buying a new house, losing 10 pounds, getting in shape, or learning a new skill. You can log metrics for goals and view your progress in a graphical format. From the Health + Goals topic, there are several aspects of goals that you can manage. You can log your goal progress and show totals or averages for designated time periods and subsequently view the progress in a list or graph. Several values are provided, such as units (pounds, minutes, day, %, and more); target values; and default values. 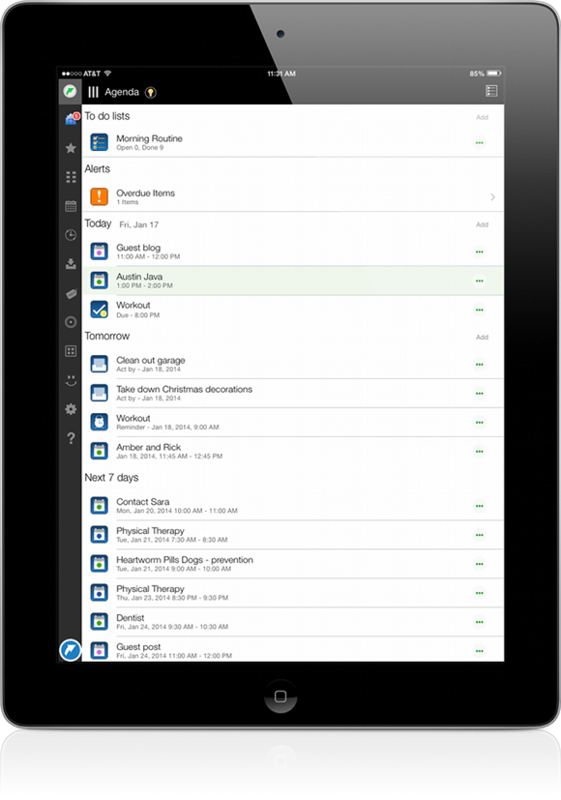 In addition, you can associate items such as tasks, reminders, appointments, etc. to goal metrics for reminders or other reference materials. The following example shows a goal of going on vacation. This user wishes to include a workout routine to get in shape for the trip and a log of saved money to reach her goal. Both of these aspects of the goal can be measured in one log form. The Bookmarks + Lockers topic now has lockers for securely storing secret information, such as text, photos, and audio. Lockers allow you to save secret information for any information you wish to secure. 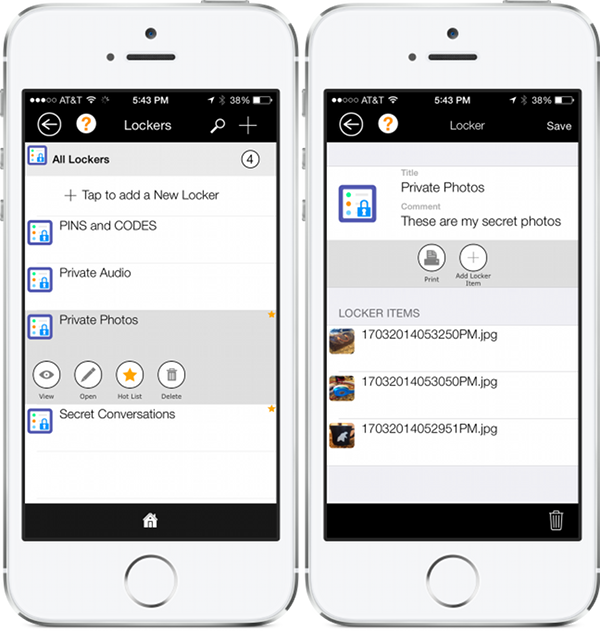 Lockers support securing of text, photos, and audio. Common uses include storing photos of credit cards, photos of passports, photos of secret receipts, sensitive audio files, and PINs. You must enter a PIN to reveal your secret data. You can feel secure because your LightArrow app uses military grade 256-bit Advanced Encryption Standard (AES) encryption. The following image shows a list of Lockers and the resulting view after you’ve entered the PIN to reveal a group of Locker Items inside a locker. Military Grade 256-bit Advanced Encryption Standard (AES) encryption has been added to sensitive data fields. This applies to PINs and account numbers in bank account detail, as well as for storing the password lock and secret question answers. 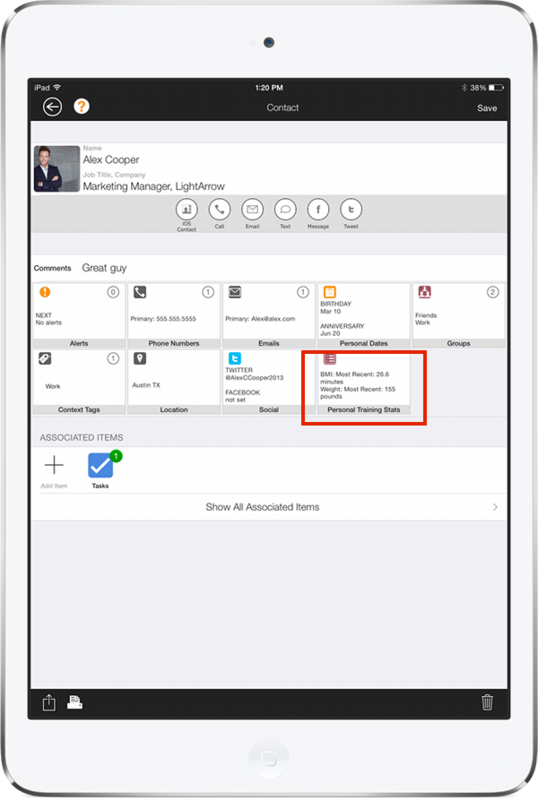 The Near Me view gives you one-tap access to a view of your LightArrow app items that are in the vicinity of your current location. 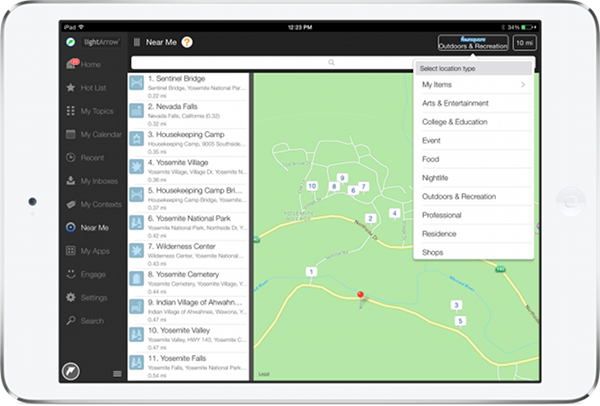 In other words, if you set a location for assets, appointments, audio, contacts, events, notes, photos, shopping items, service providers, tasks, trips, or video you can view these items on the map in the Near Me view, which helps you plan your day — especially if you’re running errands or visiting clients. 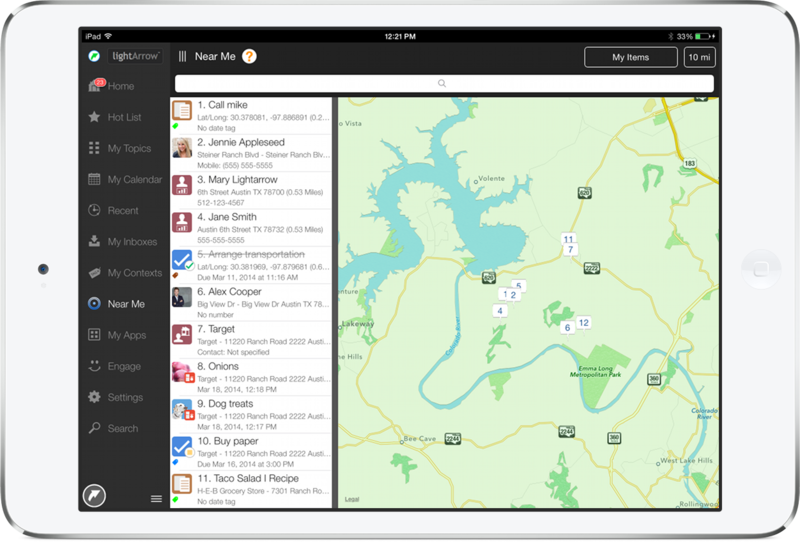 You’ll notice that the Near Me view has a new look, as shown in the following image. The Near Me view is now powered by foursquare®, which allows you to search for arts & entertainment, events, food, shops, and other types of business near you. If these businesses are businesses that you frequently use, you can convert them to Places, Sellers, Banks, or Service Providers in your LightArrow app directly from the Near Me view. In addition, you can now relocate the area you wish to view by simply dragging the pin to the new area. The following image shows an example of this view, with the pin moved to Yosemite. The Quick View interface and the Search interface have now been combined to allow you to quickly and easily find and view items. You can search for an item by typing any text (all text blocks are searched) in the Search bar or you can view items by their type of topic or by data item, simply by tapping an item type in the Data Items section or a topic item in the Topic Items section. The following image shows an example of the new combined view. Context Tags Now include color support to help you better identify items that are tagged. The following image shows an example of tasks that are flagged with context tags and the view which allows you to set context tags. Previously, when you copied a project, only the project was duplicated (without the associated tasks). Now when you copy a project, it includes all associated tasks. In the Health + Goals topic, you can now manage prescriptions for medications. You can record the prescription number, expiration date, count, remaining pills or other unit, pharmacist, and doctor. For these prescriptions, you can log when the medication is administered. The following screenshots show an example of prescription management. You can now optionally specify the calendar where you wish to push a specific LightArrow app item for many types of items. For example, if you want “work items” to appear on a work calendar, “home items” to appear on a home calendar, or certain items to appear on a shared calendar, you can specify this by item. The following image shows where you can take advantage of this option for a task. When you print items, a print time is now included in the footer and the LightArrow logo has been omitted. New, contextual online help has been added for your LightArrow app. 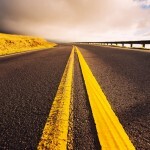 This post focuses on the most significant changes. You will notice smaller additions and defect fixes throughout the app. The explosion of data, often referred to as Big Data, is a result of the conversion of online business occurring 24×7, news and media going digital, the social media explosion, and the connected universe we live in. As a result, there’s amazing, new, and unique data elements that previously didn’t exist, that now allow incredible new insights for common sales, marketing and researcher tasks such as profiling, prospecting, and researching — all to gain deeper insights to improve customer engagement and business execution. Your personal big data can include any information about you. The purpose of measuring these aspects of your life is to gain knowledge about yourself, which can lead to insights for improving your health and happiness and for reaching personal goals. 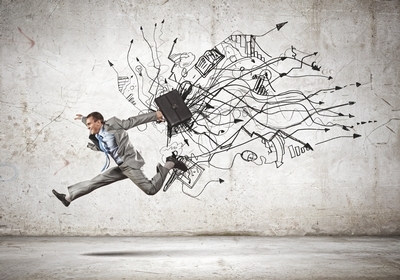 Personal analytics is also referred to as the “Quantified Self.” If you’re unfamiliar with the “Quantified Self” movement, refer to http://quantifiedself.com/ to learn more about self-tracking. The technology for measuring personal analytics for health and fitness has been around for some time. In fact, I purchased my first Polar® heart rate monitor to calculate calories burned from my workouts at least ten years ago. Wearables became mainstream after the partnership between Nike and Apple came about to launch footwear that connects directly to the iPod to measure time, distance, calories burned and pace. Since this time, several products have emerged that measure everything from sleep patterns, blood pressure, miles, to calories burned. These wearable devices are convenient because they automatically measure many analytics so there’s no need to manually enter the information. Most of these devices include an online component, and the corporations that collect this data from the wearables are able to utilize this information to better serve you, and they can also tailor their marketing efforts to suit your buying habits if their privacy policies permit this usage. With the growth of wearables, apps, and tools to gather your personal data about health, fitness, wellness, etc., eventually you’ll find yourself wearing several different devices and tracking data with a variety of websites and tools. You might end up looking like Inspector Gadget. At LightArrow, we take a different approach. Consider LifeTopix or My.Agenda as the Swiss Army knives of tracking. They provide the flexibility for you to manage the personal metrics that are suitable for your life or business. 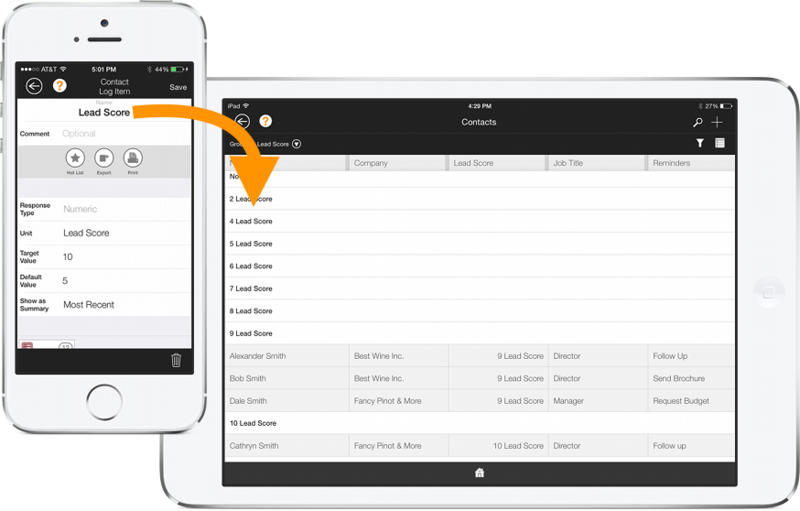 For example, LifeTopix and My.Agenda (through an in-app purchase) include built-in and user-configurable log forms that allow tracking. 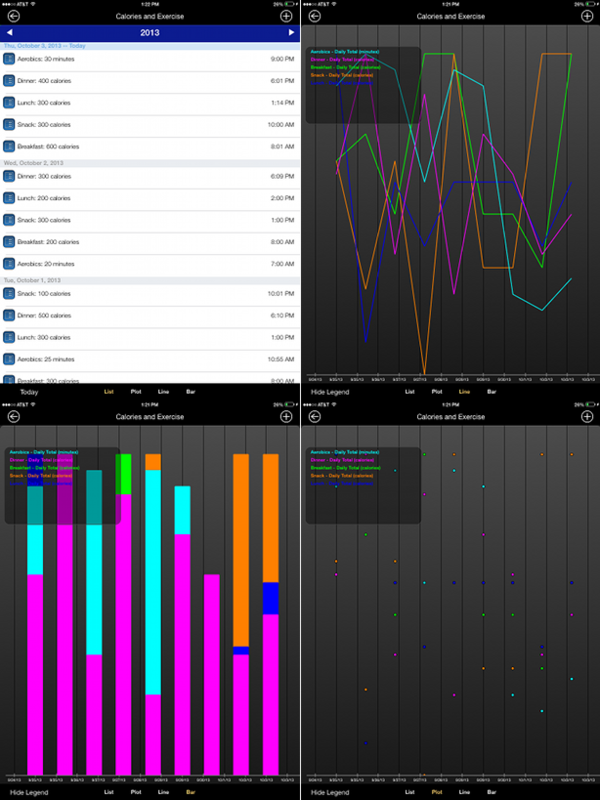 The multiple topic log form below includes a variety of aspects of life that one user likes to track – all in one form. Our apps don’t include a wearable component; however, they enable tracking of any aspect of life you wish to measure (everything from blood pressure to baby burps). You can easily enter your personal data by using the LifeTopix or My.Agenda app on your Apple device, and it’s in context with everything else in your life, such as your schedule, to-dos, schooling, travel, finances, shopping, events, contacts, assets, and more through LightArrow’s 12 life topics. If you use a variety of wearables and websites to track different aspects of life, consider entering the highlights into your LifeTopix or My.Agenda app. 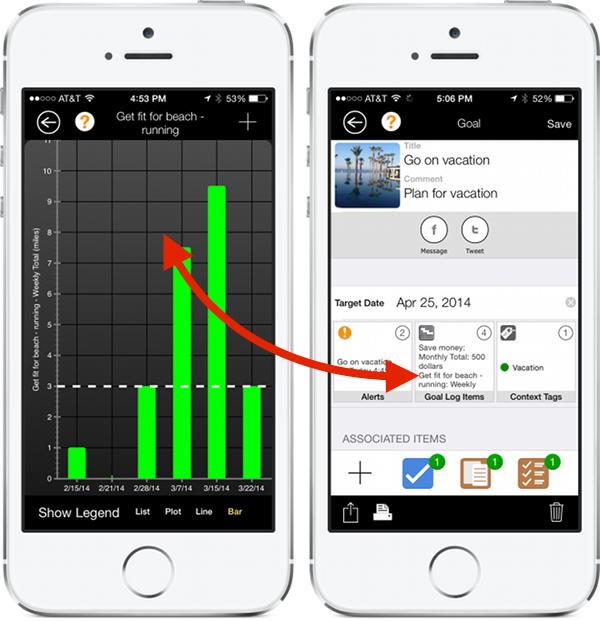 For example, you can record your total calories each week, your run mileage, and your BMI in a multiple topic log form. You’ll see useful trends over time. 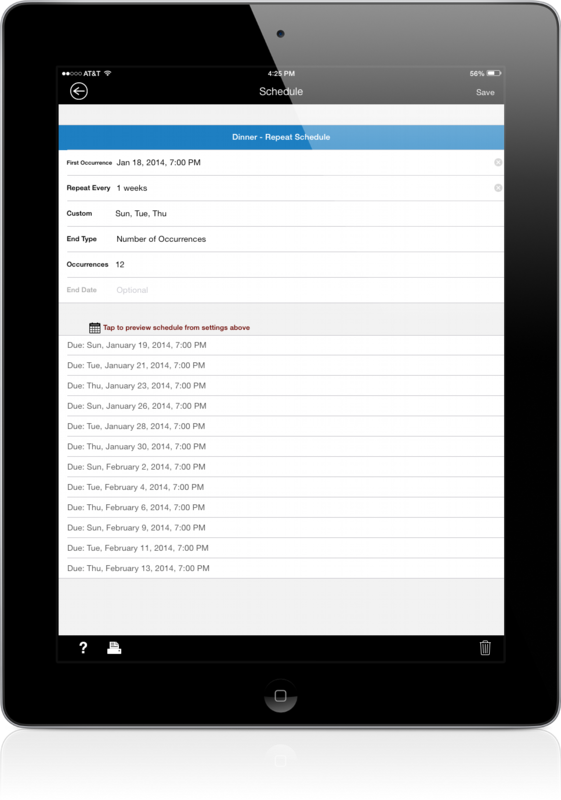 Custom log forms in LightArrow apps are easy to create. For example, the following log form was created for the first year of growth for a baby. Below, you can see how easy it is to create a form and the flexibility of the possible entries. Notice the red arrow — the types of units you can enter are endless. Once the data is entered, you’re able to gain knowledge about yourself (or others), which can lead to insights for improving health and happiness and for reaching personal goals. Several views are available for analyzing your data (e.g. 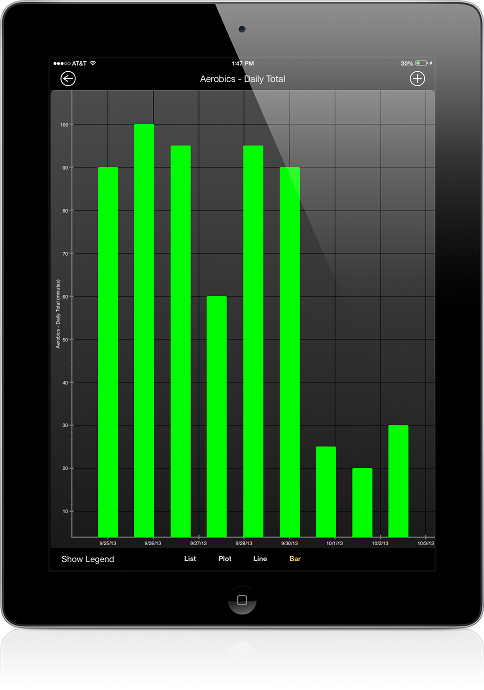 a list, plot, line, or bar chart). Imagine having the useful data below at your baby’s one year checkup. Tutorial – How Do I Create a Multi-Topic Log Form? 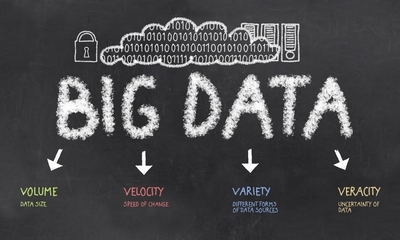 Are you ready to start measuring your own personal big data? Watch the following video to learn how. After years or even weeks of usage, imagine the multitude of data you’ll gather and the trends that will give you insight into your life. With this insight, you can take advantage of what’s working, and eliminate what’s not working. And take note, your LightArrow app data is stored on your device (not online), and you can choose to share your ever-growing data with your friends and followers over email or social media. The decision is yours. We commonly receive questions about how My.Agenda and LifeTopix differ; therefore, today we’re providing a post that gives you a good overview of the features of My.Agenda. It’s one of LightArrow’s newest apps built on the LightArrow App Engine 7. The LightArrow App Engine is utilized by all of the apps from LightArrow, and the engine provides a common set of functionality across all of the apps. Out of the box, My. Agenda includes Reminders, Backup and Restore, Near Me (map view), Passcode Lock, Hot List, Context Tags, Bookmarks, Quick Inbox, Appointments, and the Calendar Views. You can choose to add more features and new topics through in-app purchases or you can purchase the “Everything Pack,” which essentially makes My.Agenda the equivalent of LifeTopix. My.Agenda is considered the “little sister” of LightArrow’s flagship app, LifeTopix. The My.Agenda app is available for those who want to get productive at a lower price point, US 99 cents, and add features and topics as they desire. This enables you to start small with your productivity needs and grow as your needs expand. 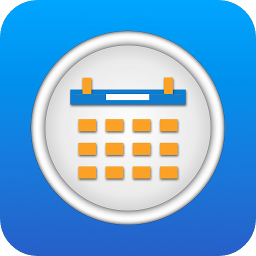 LifeTopix includes a calendar, agenda, and checklists plus 12 topics for organizing items such as Tasks + Projects, Shopping, Events, Travel + Places, People + Services, Health + Activity, Finances, Home + Assets, Education, Notes + Files, Media, and Bookmarks. 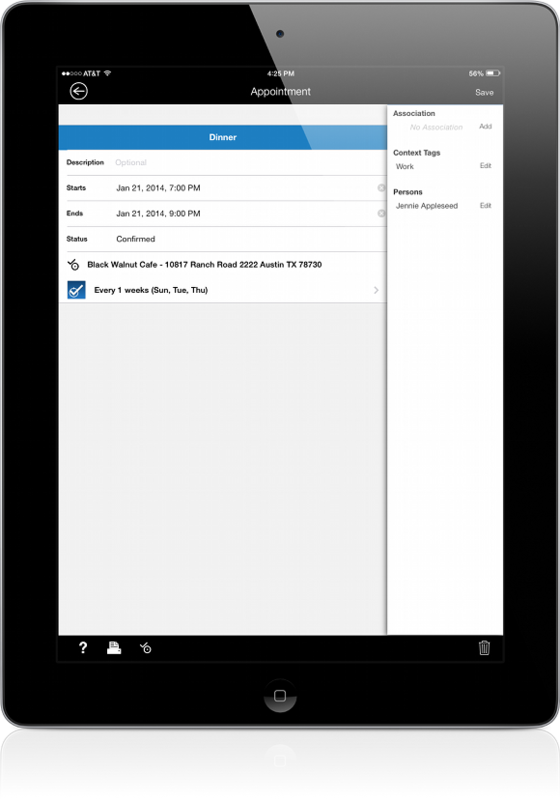 LifeTopix also includes device-to-device sync via cloud services, such as Dropbox or Box. Sync is optional with My.Agenda. If you’re contemplating swapping the built-in calendar app on your iPhone or iPad, My.Agenda is a great substitute. It acts as a “front end” to the calendars you’ve set up in your device’s Settings (including, Google, Yahoo, etc. 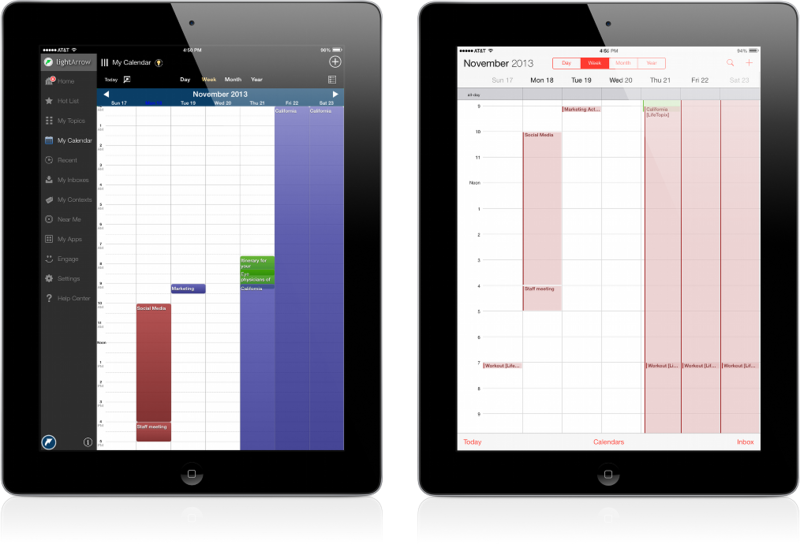 ), and it gives you additional functionality for scheduling and organizing your life. If your friends, family, or colleagues use the iOS calendar or a different calendar that your Apple device supports, you’re in luck because My.Agenda shows events from those calendars. The images in this post were created by using LifeTopix, but keep in mind that My.Agenda is very similar, and can include the same features through in-app purchases. If you wish to compare our apps in more detail, refer to http://www.lightarrow.com/compare. Let’s first discuss design. LightArrow apps are not superficial. They’re not just pretty on the outside — they also have deep substance, which pleasantly surprises most users. These apps have a multifaceted personality, and when you peel back the layers you’ll find that they’ll adapt to a multitude of uses because of their configurability. The colors, fonts, and typefaces are meant to emphasize readability. We’ve taken customer feedback to heart and applied their advice to accentuate your productivity. 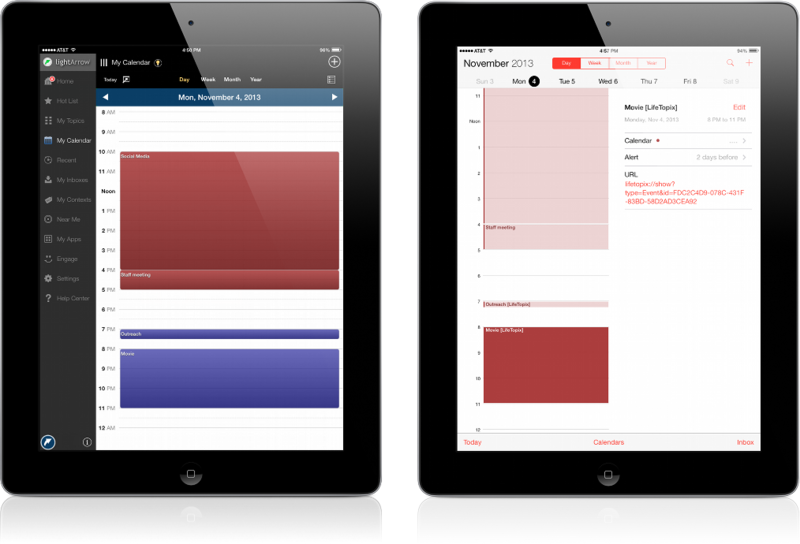 The My.Agenda app includes more functionality right out of the box than your usual calendar or to-do app. 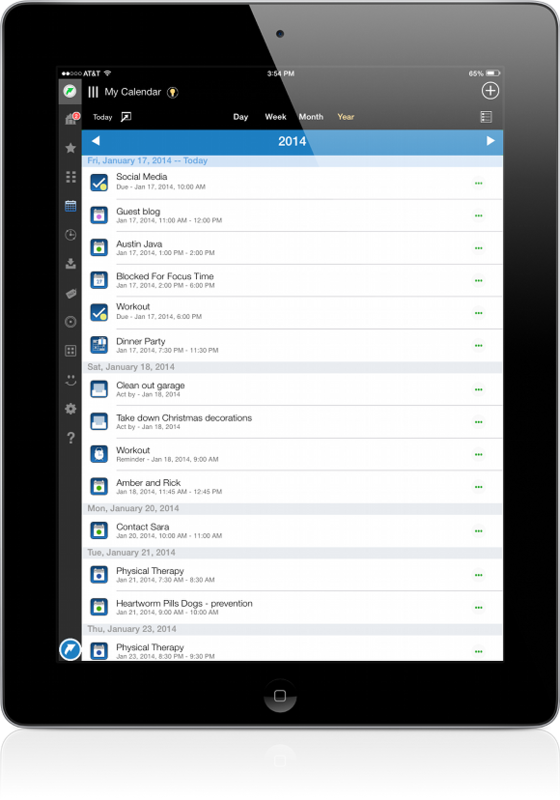 It includes your to-do lists (checklists) and your calendar in one place in an easy-to-read Agenda view. With other apps, your schedule and to-do lists are disconnected resulting in a disjointed experience. My.Agenda helps you get productive right away by eliminating the app hopping that you would experience with these detached apps. The Agenda view, which is available in both My.Agenda and LifeTopix is the view that you use to remember all the appointments, to-dos, tasks, etc. that you need to track every day. In a single glance, you know what’s going on for the day. 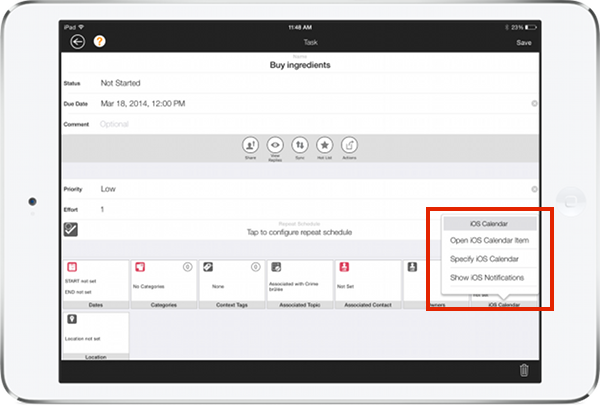 Types of items that you can create through the Agenda view vary depending on your in-app purchases, but appointments and checklists are provided out of the box. Notice that you can add your appointments and to-dos directly from this view using the Add links and the Quick Add menu at the bottom of the screen. The Agenda View is shown below. 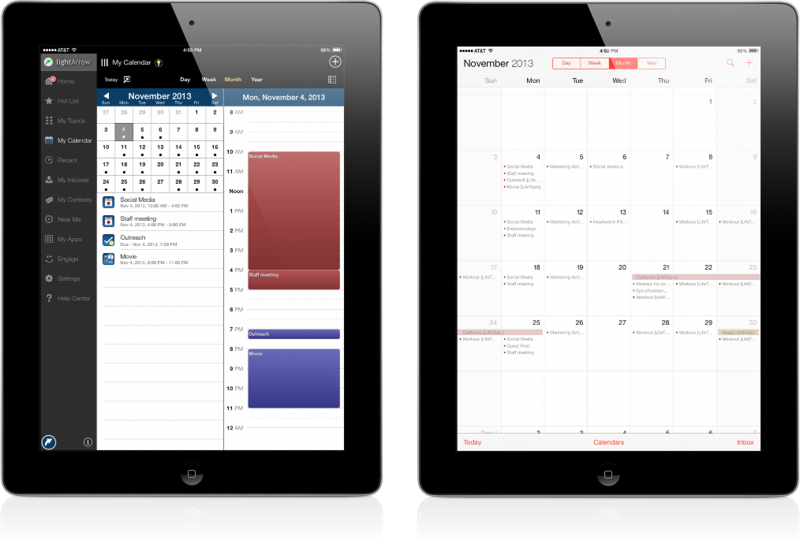 We understand that the calendar is one of the most important tools that you use for daily life. Most of us are lost without our calendars. That’s why we provide you with easy-to-read and user-friendly views for your calendar. We invite you to compare LightArrow calendars with the iOS 7 calendar views and decide which views you prefer to use for your daily life. My.Agenda provides you with a variety of views including Day, Week, Month, and Year. Furthermore, you can choose the calendars (Google, Yahoo, Outlook, etc.) and items (Appointment, tasks, etc.) you wish to view on your calendar by tapping the filter icon in the upper right of the calendar. The Day view includes a detailed list view for the day. 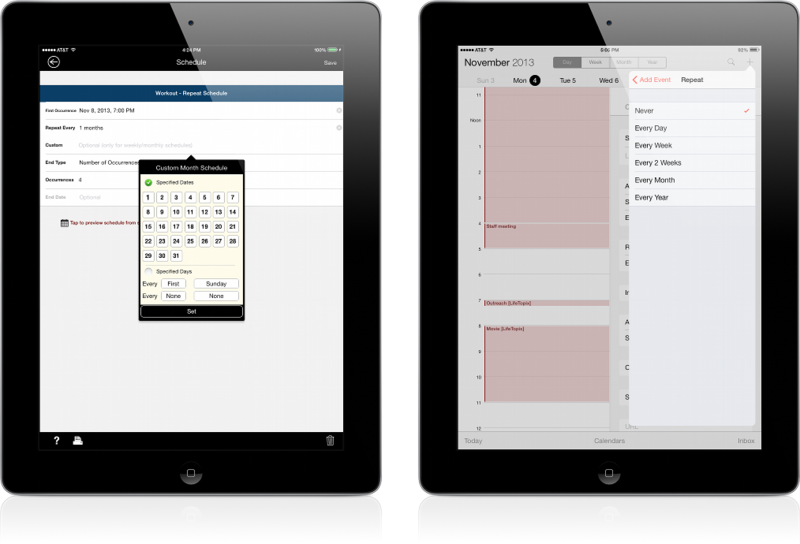 It shows you your appointments (and tasks, workouts, projects, events, etc. – depending on what you’re managing) for a given day. If you’re using multiple calendars, the events are color coded by calendar. Tapping the appointment accesses the event’s details. You can manage your items directly through this view. The Week view gives you a good overview of the items that you’ve scheduled for the week. Once again, they’re color-coded based on their calendar. Managing the items is easy – just a tap away. The Month view includes detailed list views and a calendar for the month. It shows you a list of your appointments for a chosen day and you can easily choose the day you want to view by tapping the date on the calendar. There’s an indicator on each day to show you if items are scheduled on those days. You can also completely manage those items by tapping them. 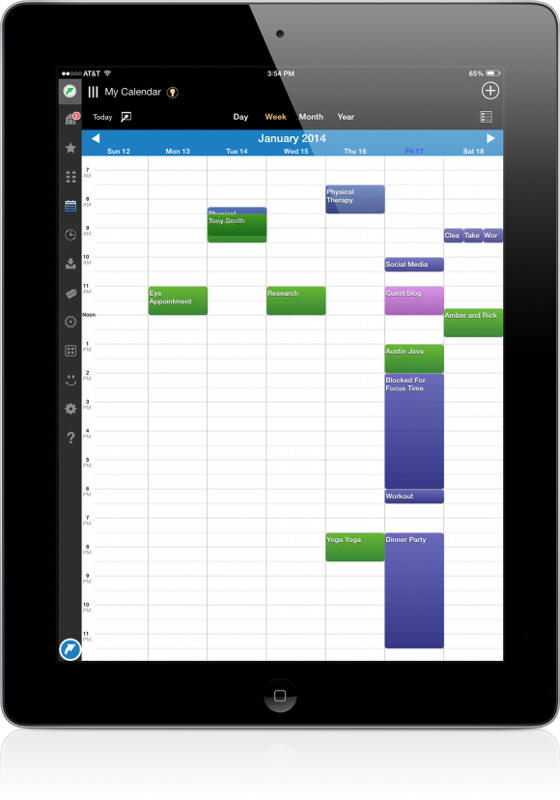 The Year view allows you to scroll through a list of all your appointments and other items in one view for the entire year. You can also access past years’ items. You can manage your items directly from this view. You’ll find an abundance of power and flexibility in appointment creation. 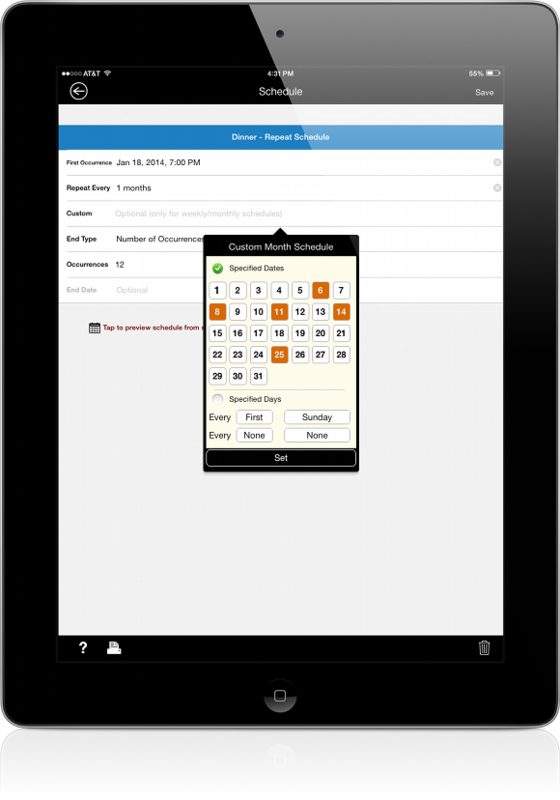 Creating an appointment is very user friendly as shown in the screenshot below. Essentially, you complete the fields and optionally add a location via Search, current location, or through a direct address. And keep in mind if you like to use Siri to quickly add events, those events will appear in your My.Agenda app, and you can tap the events in the calendar to convert them to a My.Agenda object if you wish. My.Agenda also gives you a variety of options for repeat appointments, such as various days of the week or certain days of the month. This functionality is great for part-time work schedules, education schedules, volunteer schedules, coaching, meetings, etc. — any type of appointment that occurs on a varying schedule. A custom month schedule is shown in the graphic below. Your app allows you to preview the schedule before you create it to ensure that you scheduled it correctly, which is very handy. The preview is shown in the image below. The Near Me view also helps you to get productive and plan your day according to the location of your appointments. If you add a location to your appointments (and other optional items, such as shopping items, tasks, etc. ), you can view those items on a map, which gives you a clear picture of how your day looks from a geographic perspective. 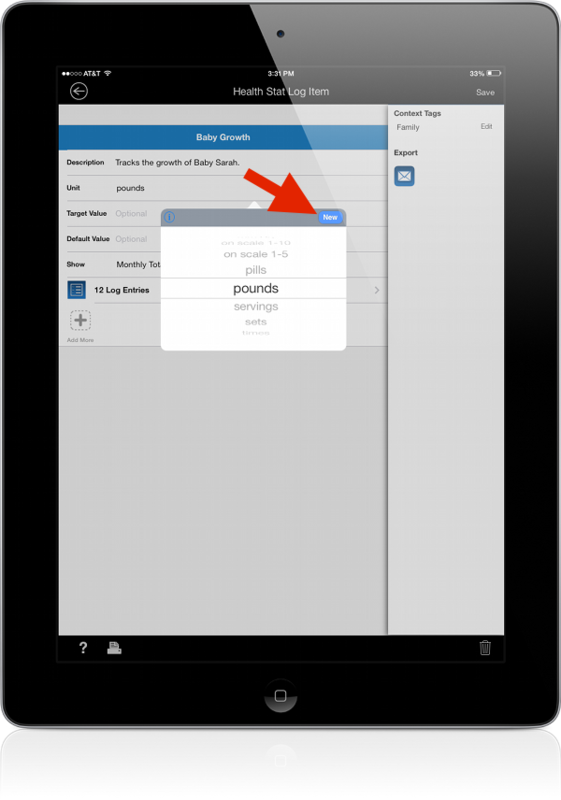 You can create both My.Agenda reminders and device (iOS) reminders directly from your app. And keep in mind that you can use Siri, and My.Agenda will show the reminders that you create by using Siri. You can view reminders in the Agenda View, and you can manage these reminders directly from your app. Note: This screenshot was taken from the latest update currently in testing and due to ship soon. Your screen will vary slightly. How do you get the Apps? LifeTopix 7.x and My.Agenda 2.x are available from the Apple App Store for US 4.99 and US .99, respectively. As universal apps, a single purchase entitles you to use these top productivity apps on your iPhone, iPad, and iPod touch. The apps require iOS 5.0 or later and are optimized for the newest devices with iOS 7. We hope this gives you a good overview of the calendar and agenda features of My.Agenda. If you have any questions, feel free to reach out! To achieve your wishes and dreams, setting goals is an important step. Goals fuel your motivation and as you make progress, seeing the results boosts your self esteem and encourages you to work even harder. The key to success is to make a plan and take action, and eventually you’ll be enjoying the fruits of your labor. Great news. 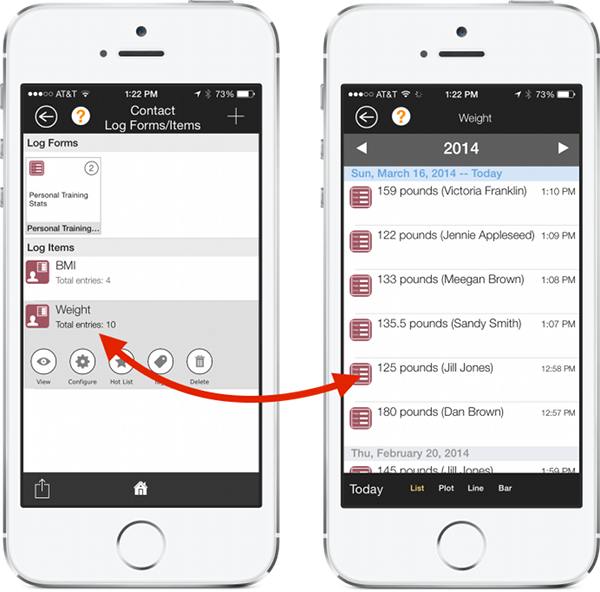 Whether you want to get fit, lose 10 pounds, improve your health or help others in 2014, the Life­Topix personal organization app includes what you need to set goals, make plans and track your progress. It’s simple. 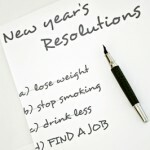 Below you’ll find a slideshow that provides tips for achieving your New Year’s resolutions. Please comment and let us know how your goals are progressing! It’s nearly impossible to believe that the holidays are just around the corner. In fact, the shopping season is even shorter this year because Thanksgiving falls later than usual. This weekend is a wonderful time to start compiling your holiday shopping lists. Retailers are gearing up for Black Friday, and the early shoppers are posed to pick up the best deals. We have three amazing apps available from the Apple App Store to help you make shopping lists: LifeTopix, My.Agenda (with in-app purchase), and My.Shopping. What’s great about LightArrow apps is they’re not just beneficial for the holiday season – they’ll help you stay productive and on task all year long. The short slideshow below introduces LifeTopix’s shopping features. Enjoy! With the LifeTopix and My.Shopping apps, you can manage shopping lists and items, products, sellers, coupons, gifts (given and received), and things to sell. With LifeTopix, you can also manage charitable donations, holiday event planning, and website passwords (for online shopping purposes). You can compare LightArrow apps in detail by viewing our Comparison Guide. Happy Holidays from Team LightArrow! Not Crazy About the New iOS 7 Calendar App? Here’s the Answer. You’ve updated to iOS 7 and you’ve noticed the new, beautiful minimalist design and the lack of skeuomorphism, which is a fancy word for faux stitching, wood panels, and leather. Essentially, the metaphors of the real world have vanished and are replaced with a more modern, flat design. It makes me think of upgrading the decor at Grandma’s house with the sleek interior design of the W Hotel. We at LightArrow are huge fans of iOS 7. It is a great leap forward in our opinion in both form and function. However, with significant change there are always some “challenges” in terms of people’s habits and personal preferences. One of the biggest changes is the calendar for both the iPhone and the iPad. The calendar is now black and white and red all over. Sure, it’s pretty, but it’s a real-life riddle to many users as to why some of our favorite views are missing — with the most noticeable being the month detail view. I personally can’t stand the fact when I am on any given day, there is no list view for all the events at the bottom like there used to be. This is an extremely bizarre thing for them to get rid of in my opinion. It is much more cumbersome to see your events quickly for the day now. Good news. There are several apps at the Apple App Store that can fill the void, including our apps — LifeTopix and My.Agenda. A little background — LifeTopix is our full-featured personal information manager and My.Agenda is the starter version of LifeTopix that you can customize to meet your needs through in-app purchases. You can compare the apps by following this link. I Want an Agenda View! Check out our side-by-side comparisons below and decide for yourself if the LifeTopix Calendar Views provide you with a better alternative to the new iOS 7 calendar. Remember, you don’t have to replace the iOS 7 calendar because LifeTopix shows you all your events from it (including your Google, Yahoo, and Outlook events that you display on your iOS device calendar). And keep in mind that LifeTopix is a complete personal information manager so there are several types of objects that it supports, which the iOS 7 calendar does not support. In addition, searching all items (appointments, notes, tasks, etc.) is included from the Quick Menu at the bottom left. This might not be evident from the images. The Month View is several people’s biggest disappointment in iOS 7 because it no longer includes the detailed list view in the main view. Instead of showing you the entire month with tiny appointments, LifeTopix shows you a list of your appointments for a chosen day and you can easily choose the day you want to view by tapping the date. There’s an indicator on each day to show you if items are scheduled on those days. You can also completely manage those items by tapping them. Click the image to see a bigger view. The LifeTopix Calendar Year View allows you to scroll through a list of all your appointments and other items in one view for the entire year. You can also access past years’ items. The iOS 7 Calendar Year View only shows a calendar with the current date highlighted. On the iOS 7 calendar, tapping a date returns you to the IOS 7 Calendar Month View. Alternatively, with LifeTopix, you can manage your items directly from this view. 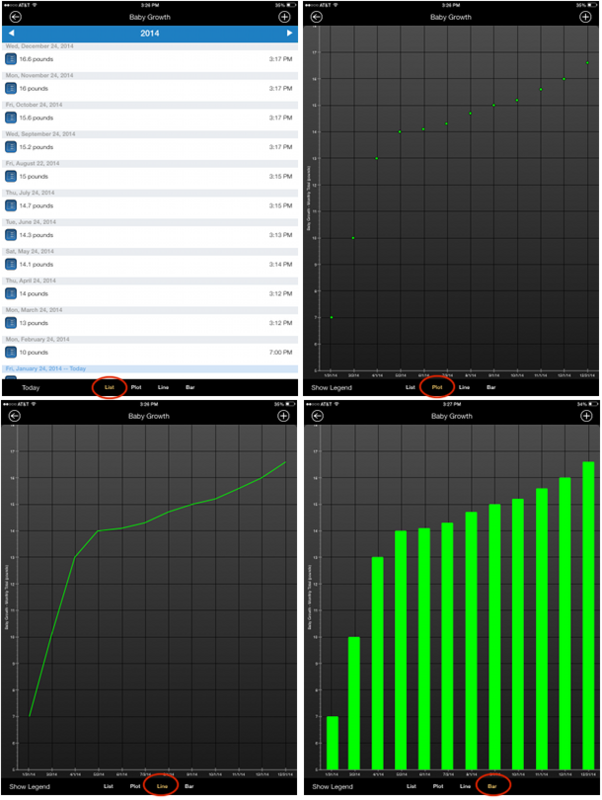 The LifeTopix Calendar Week View and the iOS 7 Calendar Week View are very similar. Besides the look and feel, there are only a few subtle differences in functionality. In LifeTopix, you tap the arrow to move through the week. In the IOS 7 Calendar, you scroll to the right or left. This is a personal preference. 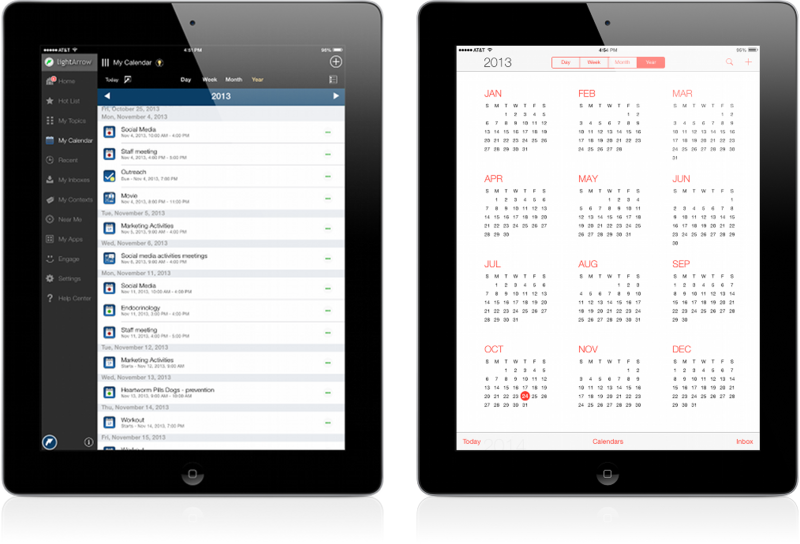 The primary difference between the LifeTopix Calendar Day View and the iOS 7 Calendar Day View is the side-by-side view that the IOS 7 calendar provides. Both calendars require you to open a management screen when editing. 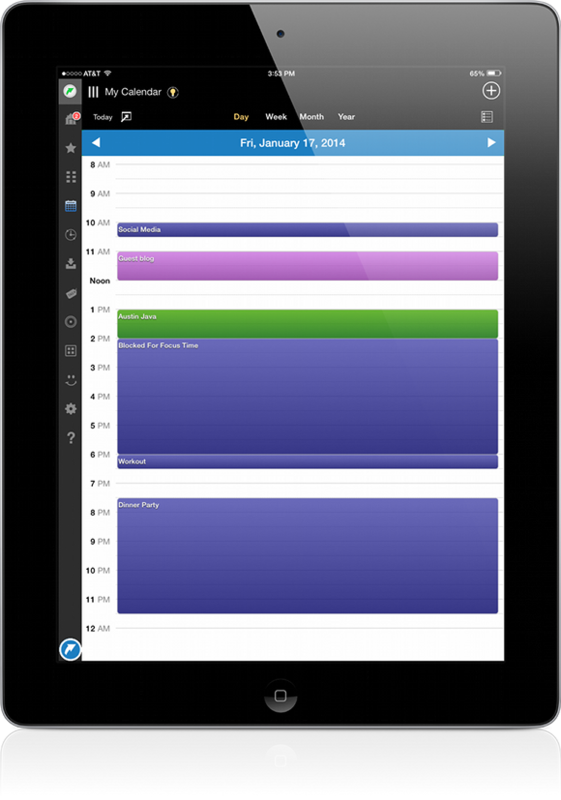 LifeTopix includes many more options for repeat schedules over the iOS 7 Calendar. Custom schedules are available in LifeTopix as the image below shows, which provides you with more flexibility when setting up your appointments and tasks. What do you think? Does the LifeTopix app address your calendar issues? Please comment and let us know! http://lightarrow.com/wpcms/wp-content/uploads/2013/10/agenda1.png 209 99 Marilyn Rogers http://lightarrow.com/mktgimages/lightArrowLogo.png Marilyn Rogers2013-10-24 23:47:242014-07-16 15:06:10Not Crazy About the New iOS 7 Calendar App? Here’s the Answer. The Quantified Self is a movement that advocates measuring aspects of your daily life such as calories, blood pressure, exercise, diet, heart rate, and other metrics. The purpose of measuring these aspects of your life is to gain knowledge about yourself, which can lead to insights for improving your health and happiness and for reaching personal goals. Quantified Self is also referred to as self tracking or self quantifying. Are you skeptical? Is the Quantified Self movement just a fad? Consider this. Would you make a serious business decision without data to back it up? So why not make decisions for your personal life based on analytical data? Data is POWER — however you apply it. Collecting data about yourself can empower you to make the right decisions in life. Still doubtful? Watch this inspiring talk by Ari Meisel about how he was able to relieve his Crohn’s disease symptoms through analyzing his data: http://quantifiedself.com/2011/10/ari-meisel-on-curing-the-incurable-through-self-experimentation/ . 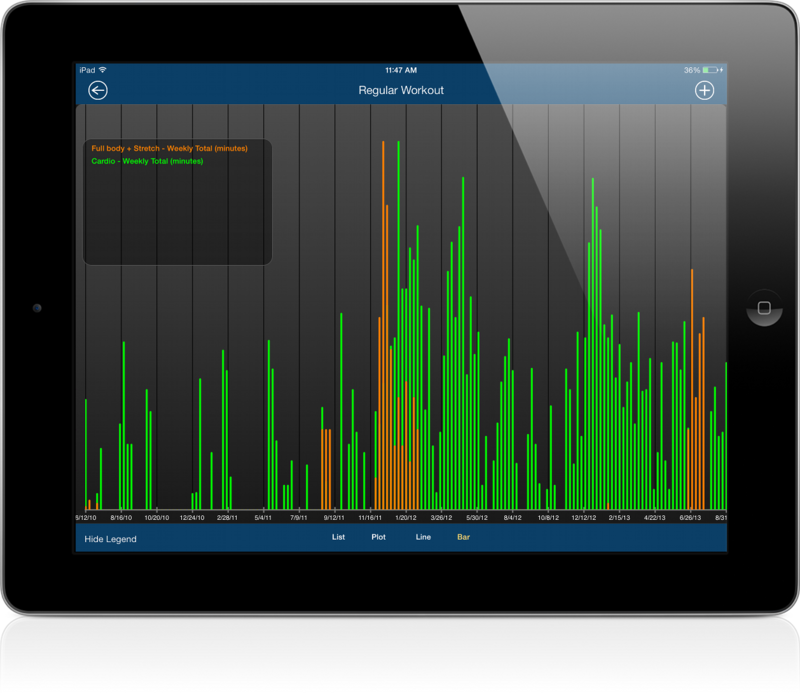 There are several apps and tools for gathering data manually and automatically. You can achieve automatic collection by using Wearables, which are devices that you wear that record various health-related analytics automatically such as calories burned, exercise, sleep, steps, or blood pressure, and sometimes they provide accompanying software. You’ll find several apps that allow you to to record these items both manually and automatically, but many are not flexible enough to record the items that YOU wish to record. 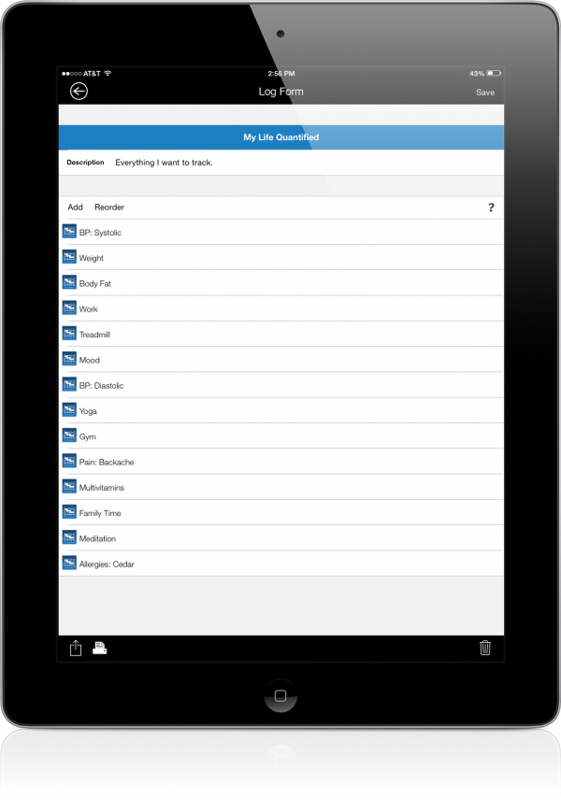 We take a different approach with LifeTopix (or the starter app My.Agenda) by allowing you to define the items YOU wish to record and log these items when and where you wish. This is accomplished through LifeTopix’s Log Forms and Multi-Topic Log Forms found in the Health + Activity topic. With LifeTopix, the power and flexibility is accomplished by allowing you to define what to measure with varying self-defined units. You’ll find out-of-the-box log forms including items such as Aerobics, Chores, Cooking, Family Time, Gym, Meditation, Reading, Body Fat, Blood Sugar, Breakfast, Dinner, and much more. However, if you want to track more complex or obscure items, such as happiness, thyroid stimulating hormone (TSH), C-reactive protein (CRP), sleep quality, hot flashes, supplements, etc. with LifeTopix, you can. You can easily add, modify, or remove log forms to track any metric that’s appropriate for you. You’ll be surprised at the variety of units that we provide out of the box including: percent, calories, cups, days, grams, hours, inches, mg/dL, miles, minutes, mm Hg, on scale 1-10, on scale 1-5, pills, pounds, servings, sets, and times. Furthermore, we give you the ability to define your own units; therefore, you can essentially measure any metric you wish to measure. One of our users provided us with the following screenshot of his log form, which measures his regular workout, including a full body stretch and cardio. He’s recorded these items over a long period of time, which helps him to analyze at what times he’s more motivated to complete his workout and what’s going on in his life that affects his workout. Another user chose to measure calories and aerobic activity for weight loss. The following image shows an example of the log form entries that this user built. As this user logs their entries over time, she can view the following types of graphs (line, bar, and plot) to measure progress and trends and she can also view a list of entries. Are you ready to try measuring life statistics for yourself? Watch the following video to learn how.